As I mentioned on Friday, Heather Powers of HumbleBeads has invited those beaders who are unfortunately not at Bead Fest to have our own pity party at home. I didn't play along yesterday with the Inspiration Adventure, but wanted to ensure that I did today's Class of One. Pat and I have decided to go on a three-day juice fast that we started this morning. He assures me that the best way to get past that hungry-empty stomach feeling is to just stay busy and keep my attention elsewhere. This project has done just that! Hurray. I started by picking from my vast array of jewelry books. 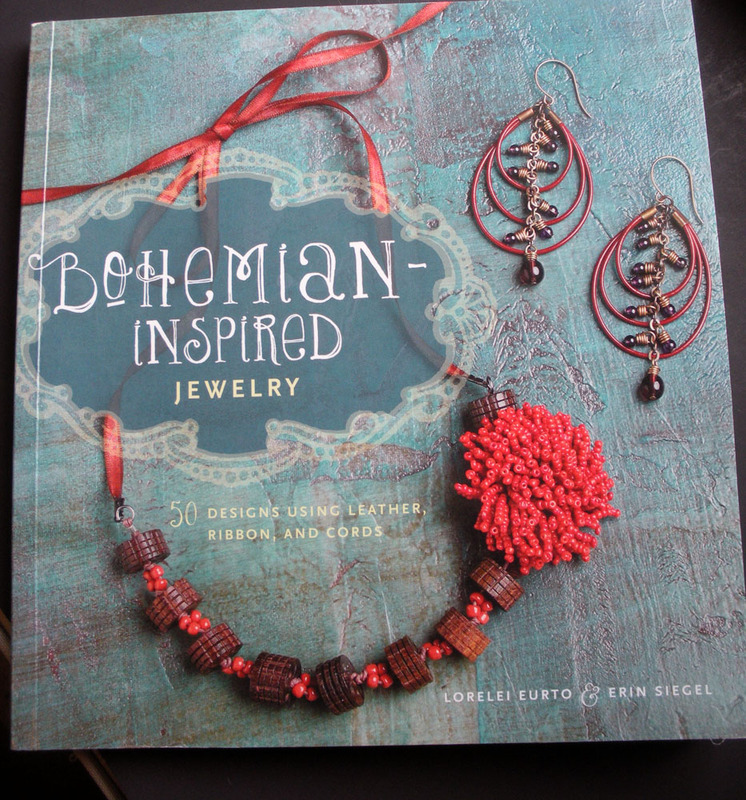 I chose Bohemian Inspired Jewelry by Lorelei Eurto and Erin Siegel. The hardest part of the whole process was choosing which of the 50 wonderful tutorials I wanted to attempt. It came down to what supplies I had on hand. When I ordered my book from Lorelei herself, she included a bit of crepe silk cord in as a surprise. 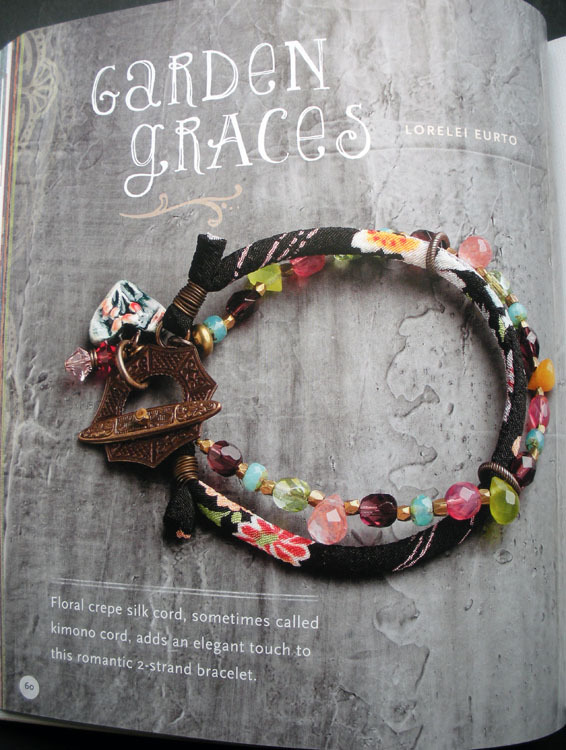 So I chose her "Garden Graces" bracelet design that uses the crepe silk. 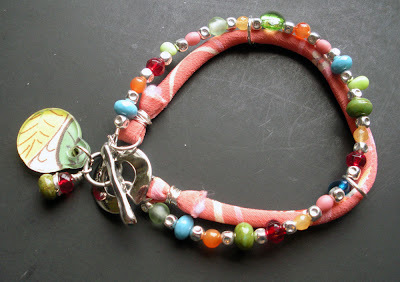 With a different color of cord and much different stash than Lorelei, I made this bracelet my own with some colors that scream candy store to me. I actually picked my beads based on the colors that are in the flowers on the silk. Unfortunately, the section I used doesn't include most of them. Oh well. . .I think it works out beautifully either way. I also included a charm of my own design made from a Tim Holtz tag, scrapbook paper, paint, and sealer instead of the ceramic charm Lorelei suggested in the tutorial. We work with what we've got. I definitely enjoyed making this bracelet and encourage you to pick up a copy of the book. There are tons of beautiful and easy to understand designs. In addition to coming up with the idea to have this Pity Party, Heather is offering up a giveaway each day on her blog (I think you have until the end of today to leave comments on her blog posts as well as spread the word for chances to win gift certificates to her shop. How awesome is that!?) Today she's asking for links to inspiring tutorials online, bead-related or not. I'm going to share this one. As much as I love and hoard buttons, I shouldn't have any problem coming up with supplies to make a buttload of these. Now, to go find something else to distract myself with before I start chewing on my keyboard! Your silk bracelet is lovely. 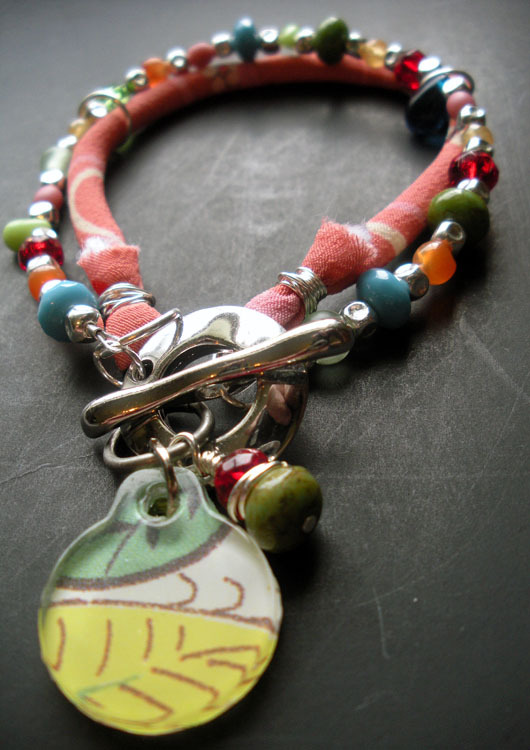 Such yummy colors, and I love your pendant too. Thanks for sharing that button tute. I love buttons but have not been succesful using them in my jewerly. I have been making a few things from Bohemian Inspired Jewelry too! 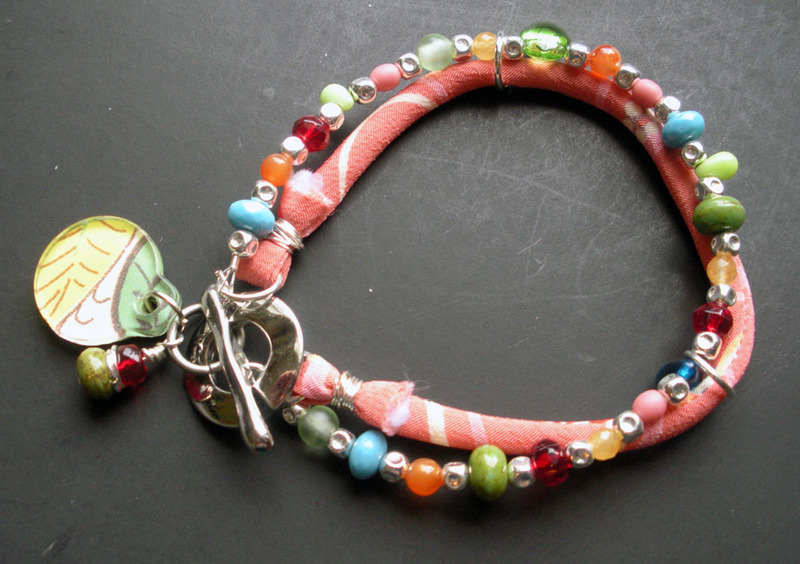 You bracelet is beautiful and I love the harm you added it definitely gives the feel of a sweet yummy piece! Good luck with the fruit and juice fast. I love your bracelets they both are very pretty and different. AntiquityT- Aw, thank you so much! I really like how the tutorial from Lorelei turned out using the cord she gifted me. . .It was fate or something. ;) Yes, that book is just full of so much eye candy and great ways to use leather and cord and whatnot. Inspirational indeed! !